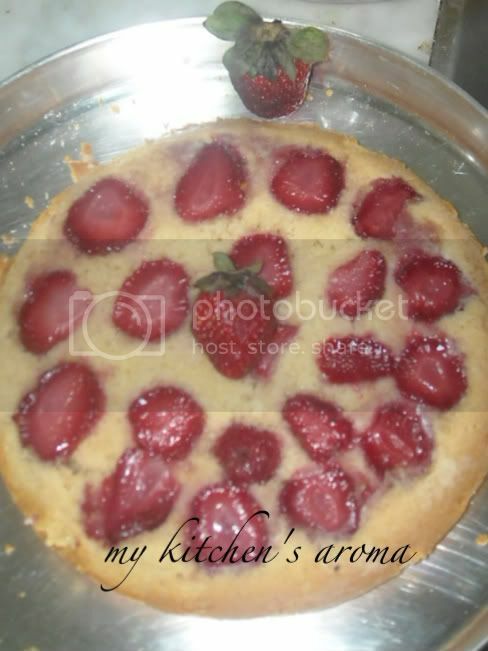 Since long i wanted to make this cake and when i googled for the recipe i got many sites with the recipes but i used the same recipe which i use for my cakes. Melt the 2 tablespoons of butter, mix in the brown sugar, add the strawberries, and then set it to the side. In a mixing bowl stir the flour, sugar, and baking powder together. Then add the milk, butter, egg, and vanilla. Mix with a mixer until smooth. Line the cake pan with butter.Arrange strawberry pieces.Gently pour the batter on the fruit pcs and be careful the berries are not disturbed. Wow, that sure was a perfect upside down cake. Sounds delicious too. am sure that tasted delightful..looks so pretty.. The cake is so lovely and sweet! Can I have a piece please? 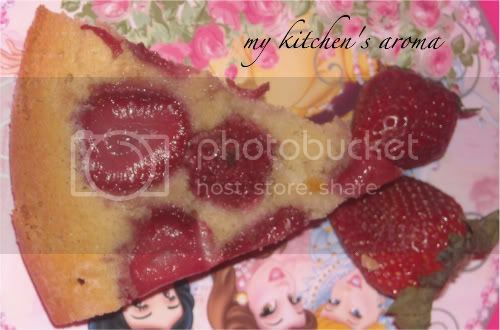 Woww never thought of making out strawberry upside down cake..Beautiful cake!! Delicious cake Saritha... Has come out so perfect and looks yummy. Wow!!! Cake looks fabulously yummy !!! Beautiful and such an yummy cake... Reminds me of summer!! !